After the last major dust storm of our long, hot summer, you probably wished you had a power washer to help clean up your yard and house. Not only are power washers a great help for big cleaning jobs, of course, they’re also fun to use. These power or pressure washers can be powered by electric motors or gas engines to run a pump that pressurizes water from your garden hose for messy cleaning jobs. 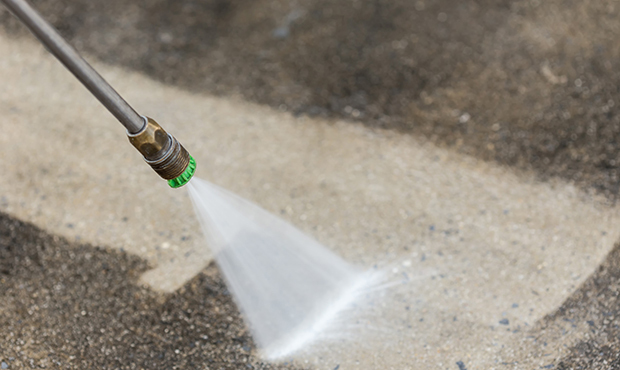 Electric pressure washers are the best choice for cleaning cars, outdoor grills and your garage floor. Gas-powered washers deliver higher pressure for bigger jobs, like cleaning off the exterior of a house before repainting or removing stains on concrete driveways. If you’re planning a one-time big cleaning job, you might want to rent one because more powerful washers generally cost more and sell for about $250 to $500. Electric washers that provide a lesser level of pounds per square inch (psi) can sell for under $100. Lower cost units that deliver less than 2,400 psi generally come with an adjustable spray nozzle that delivers 60-degree fan patterns. Heavier-duty, higher pressure units can also have a variety of nozzle tips that deliver specific fan patterns for specific tasks. While the water pressure needs to be higher to remove embedded dirt and stains, it’s still the water volume that flushes all that mess away. Washers that provide greater amounts of gallons of water per minute (gpm) can make your job go more quickly. You can find out how much psi and gpm you need for various jobs by looking at charts posted on the internet. You can definitely save money if you don’t need to buy or rent a larger unit. You can run water with detergents added to it through a pressure washer if you use a wide spray pattern. But for best results, first loosen the dirt with plain water under high pressure using a medium spray pattern. Then apply the detergent with the washer and let it sit a few minutes to penetrate. Finally, rinse off the surface with plain water. Remember that power washers can do serious damage to bricks or pavers or concrete if you use too high a pressure setting while cleaning these surfaces. Improper or aggressive cleaning can damage concrete, pavers or bricks to the point that repairs or replacement might be needed. Before you start your job, you need to have a sturdy garden hose and tarps on hand to cover plants or some areas of your yard or house. • Read the instructions for your pressure washer carefully before starting a job. You might also want to seek advice from the store that sold or rented out your unit. • Don’t point the sprayer at people or pets or even yourself. Although that might sound improbable, you could injure your hand if you put it in front of the spray device while water is gushing out. • Wear safety glasses when operating a pressure washer. • Don’t climb a ladder in order to use the washer at another angle. When you squeeze the trigger on your device for the first time, the recoil could knock you off the ladder. • Be especially careful when spraying water around power lines, electrical panels or outlets or meters. • Engage the safety lock on the trigger when you’re not washing any surface.